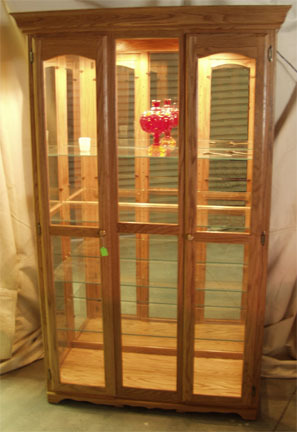 Here you can see our solid oak glass display cabinet with the inside light on, and no flash. Don apologizes for the crummy job he did editing his reflection out of the mirrored back of the cabinet, but it is the best looking one we had. Here you can see the true beauty of the cabinet in the warm, basking glow of the lights, and you will notice that the Amish have managed to get the lights to cover evenly all the way through to the bottom. No matter what you decide to display in here, it’s going to look its best!